May 2015 – NEPAL – A major 7.3 magnitude earthquake has hit Nepal tonight, less than three weeks after a devastating quake left thousands dead and buildings ruined. The quake was originally designated as a 7.4 event, but it was later downgraded to a 7.3 magnitude quake by the USGS. Several buildings collapsed in the isolated town of Chautara, with at least four people killed, according to Paul Dillon, a spokesman with the International Organization for Migration. A rescue team from the agency has begun searching through the wreckage of the little town, he said. Chautara has become a hub for humanitarian aid in the wake of a major April 25 quake that killed more than 8,150 people and injured more than 17,860 as it flattened mountain villages and destroyed buildings. Tuesday’s quake was deeper, however, coming from a depth of 18.5 kilometers (11.5 miles) versus the April 25th quake that hit 15 kilometers (9.3 miles). Aid agencies were still struggling Tuesday afternoon to get reports from outside of the capital. “We’re thinking about children across the country, and who are already suffering. This could make them even more vulnerable,” Ms Foley said. In the capital of Kathmandu, the quake sent people rushing outside of their homes. The tremors in Kathmandu lasted close to a minute according to an AFP correspondent in the city, with the ground swaying. Sirens could be heard soon afterwards and people were seen running screaming onto the streets of Kathmandu and nearby cities, while telephone connections were down. May 2015 – COSTA RICA – In a span of eight hours on Monday night and into early Tuesday, experts from the University of Costa Rica and the National University registered at least 23 temblors with epicenters located north of the province of Cartago, some 22 kilometers northeast of the Costa Rican capital. 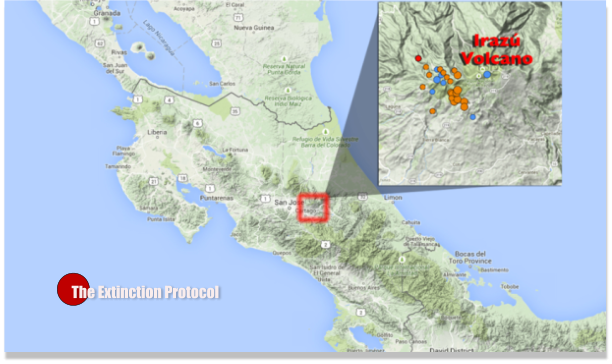 Ronny Quintero, a seismologist at UNA’s Volcanological and Seismological Observatory of Costa Rica (OVSICORI) reported that the temblors originated on local faults west of Irazú Volcano’s main crater. Experts said they are not directly related to the volcano’s activity. The first occurred at 8:19 p.m. with a magnitude of 3.1 and and an epicenter 10 kilometers northwest of Pacayas. Several minor earthquakes with magnitudes ranging from 2.4 to 3.7 followed, mainly in areas north and east of Cartago in the cantons of Jiménez and Oreamuno. Most of the minor quakes went unnoticed by local residents. TOKYO (AP) -- A powerful and extremely deep earthquake struck near remote Japanese islands and shook most of the country Saturday evening, but officials said there was no threat of a tsunami, and no injuries or damage were immediately reported. 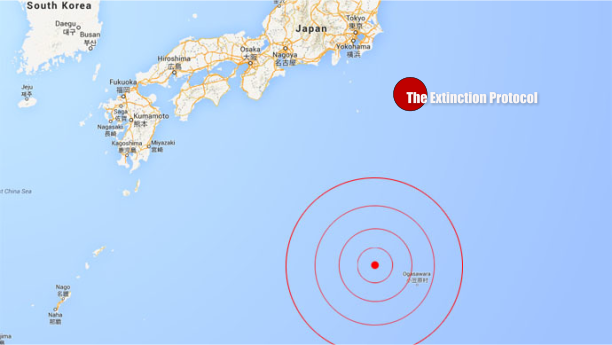 The magnitude-8.5 offshore quake struck off the Ogasawara islands at a depth of 590 kilometers (370 miles), Japan's Meteorological Agency said. The U.S. Geological Survey said the quake had a magnitude of 7.8 and a depth of 678 kilometers (421 miles). The temblor was powerful enough to rattle most of Japan, from the southern islands of Okinawa to Hokkaido in the north. Buildings swayed in Tokyo - about 1,000 kilometers (620 miles) north of the Ogasawara islands - and disrupted some train services in the city. About 400 houses in Saitama prefecture, just north of Tokyo, were without power, according to the Tokyo Electric Power Co.
At Tokyo's Roppongi Hills shopping and business complex, elevators stopped soon after the earthquake struck the area. Yoshiyuki Sasamoto, a municipal official on Chichijima island, which is part of the Ogasawara island group, said he initially felt a mild tremor, but when he thought it was over "there was a violent shaking and I couldn't even stand on my feet." At an inn on the Ogasawara island of Hahajima, furniture shook violently, although nothing fell or broke, innkeeper Michiko Orita told public broadcaster NHK. "It was so frightening. The entire house shook and a Buddhist altar violently swayed like I have never experienced before," she said, adding that all her guests were safe. NHK said there were no reports of injuries or damage from the quake. A noteworthy magnitude 5.8 earthquake has struck off the shores of Oregon along the West coast of the United States. These earthquakes were forecast to occur this week, forecast issued 2 days ago. Within the past 24 hours, we saw two West coast earthquakes which led up to this movement near the coast or Oregon. First, a 4.1M earthquake struck near Salton Sea butte Volcanoes, and a 2nd 3.2M earthquake struck near the Markagunt Volcanic plateau in Oregon. Now this 5.8M earthquake off the coast of Oregon occurred very close to the newly erupting undersea volcano along the Axial Seamount. This 5.8M earthquake is proof that the warning signs for a coming large earthquake show up 1-2 days before the noteworthy movement on the West coast occurs. The “signs” of West coast movement are smaller swarms of earthquakes occurring at dormant volcanoes up the West coast BEFORE a large earthquake hits. This has now happened multiple times, seeing dormant volcanoes move BEFORE a large earthquake hits the West coast. The complete document is in the attachment. KAHB LLC announces the discovery of a potential method for predicting the largest (+M8) earthquakes, using polar magnetic fields of the sun. exists between solar polar fields, or magnetic fields associated with the north and south poles of the sun, and large earthquakes......."
Earthquake increases happen when the earth goes into an extended colder period which is where we are at now. Very interesting. He mentions planet X but refers to it as a fake science. June 2015 – AFRICA – Lead researcher Hannah Hilbert-Wolf and supervisor Dr. Eric Roberts used innovative methods to examine the ground around Mbeya in Tanzania where a large earthquake occurred some 25,000 years ago. They found evidence of fluidization (where soil behaves like quicksand) and upward displacement of material unprecedented in a continental setting, raising questions of how resilient the rapidly growing cities of the region would be in a major shake. 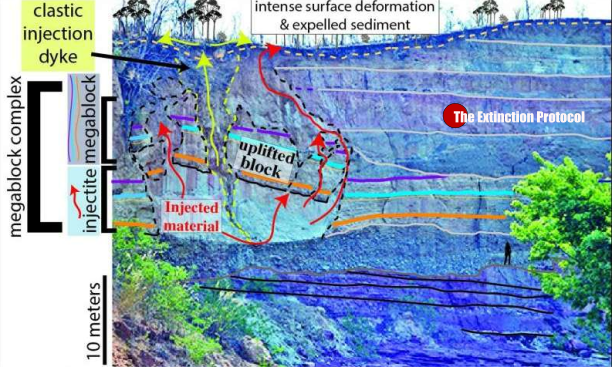 ‘We can now use this to evaluate how the ground would deform in a modern earthquake,’ said Dr. Roberts. ‘This is important because the approach is inexpensive and can be used to model how structures might be affected by future events, providing a valuable tool in hazard assessment.’ Hilbert-Wolf said the team found evidence of massive ground deformation and previously unknown styles of liquefaction and fluidization, caused by past earthquakes. ‘This could be a major concern for the growing urban population of East Africa, which has similar tectonic settings and surface conditions,’ she said. June 2015 – JAPAN – A powerful earthquake hit a small chain of islands off the coast of Japan on Tuesday. There is currently no threat of a tsunami, officials said. The U.S. Geological Survey listed it as a 6.3-magnitude quake that struck about 154 miles from Chichi-shima, Japan, which is about 550 miles south of Tokyo. “Light” shaking was felt across the Big Island, from Hilo to Kona. 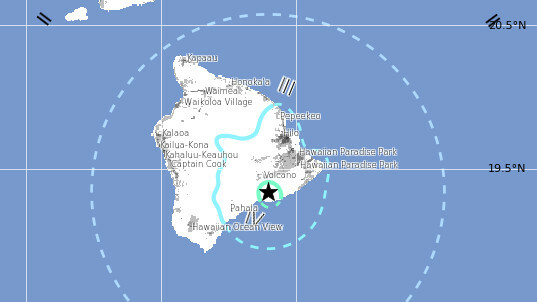 The USGS Hawaiian Volcano Observatory issued a news release after the quake. The USGS “Did you feel it?” Web site (http://earthquake.usgs.gov/eqcenter/dyfi/) received more than 740 felt reports within an hour of the earthquake. It was felt across the Island of Hawaiʻi, as well as on parts of Maui, Lāna‘i, O‘ahu. Reports indicate that residents experienced light shaking (Intensity IV) during the earthquake. At these shaking intensities, damage to buildings or structures is not expected though items not properly secured could have fallen over. A tsunami was not generated by the earthquake, reports the Pacific Tsunami Warning Center. A Hawaii County Civil Defense message spread the word (note the message says magnitude 4.8, which was the recorded intensity when the recording was made). Earthquakes can strike at any time; we’re completely at the Earth’s mercy on this one. As such, any time is a great time to get educated and prepare for if an earthquake should strike! I hope these will prove to be useful to you and your audience. Kick ’em Jenny Activity (Orange Alert) and the Associated Tsunami Threat Statement from the Pacific Tsunami Warning Center and US National Tsunami Warning Center warns Kick 'em Jenny is an active submarine volcano or seamount on the Caribbean Sea floor, located 8 km (5 mi) north of the island of Grenada and about 8 km (5 mi) west of Ronde Island in the Grenadines at roughly 12.30° N, 61.64° W.
Its summit is approximately 200 m (600 ft) below the surface of the ocean. An Orange Alert means “Highly elevated level of seismic and/or fumarolic activity or other unusual activity. Don't know if this is already an angle known to you. presenting his 4 minutes solar weatherforecast in the daily videos bobhardee shares here. Ben explains how a coming earthquake activity is related to the sun's activity. possibly causing a tsunami. The Dutch Sinse guy is a great presentator I think, without sentimental fringes. SANTIAGO, Chile (AP) -- A powerful magnitude-8.3 earthquake shook Chile's capital Wednesday night, causing buildings to sway and people to take refuge in the streets. Several strong aftershocks hit within minutes as tsunami alarms sounded in the port of Valparaiso and authorities issued a tsunami alert for the country's entire coast. The U.S. Geological Survey initially reported the quake at a preliminary magnitude of 7.9 but quickly revised the reading to 8.3. U.S. officials said the quake struck just offshore in the Pacific at 7:54 p.m. (6:54 p.m. EDT, 1154 GMT) and was centered about 141 miles (228 kilometers) north-northwest of Santiago. It said the quake was 4.8 miles (5 kilometers) below the surface. September 2015 – MEXICO – A series of earthquakes, including one of magnitude 6.6, struck in waters off the west coast of Mexico early on Sunday, but there were no immediate reports of any damage. The 6.6 magnitude quake, which the U.S. Geological Survey initially reported at a magnitude of 6.8, struck at sea around 106 km (66 miles) southwest of Los Mochis, Sinaloa, at a depth of 10 km. September 2015 – TOKYO, Japan – An earthquake with an estimated magnitude of 5.2 struck the Tokyo metropolitan area at 5:49 a.m. on Sept. 12, injuring at least 13 people. The epicenter of the quake was about 57 kilometers beneath Tokyo Bay, the Japan Meteorological Agency said. The quake recorded an intensity of lower 5 on the Japanese scale of 7 in Chofu, western Tokyo, and 4 in many of Tokyo’s 23 wards, as well as Yokohama, Kawasaki, and other areas in Kanagawa Prefecture, southern Saitama Prefecture and Urayasu, and many other municipalities in Chiba Prefecture. An intensity of 3 was recorded in parts in Ibaraki, Tochigi, Yamanashi, Gunma, Nagano and Shizuoka prefectures. A large 12 foot tsunami (4 meters) has hit Chile following the M8.3 earthquake. The earthquake, which struck at 1:49 p.m. local time on Thursday, was centered about 8 kilometers (5 miles) southeast of Tres Picos, or 30 kilometers (19 miles) northwest of Pijijiapan. It struck about 117 kilometers (72 miles) deep, making it a relatively deep earthquake. Mexico's National Seismological Service (SSN) initially measured the strength of the earthquake at 6.4 but later upgraded it to a significantly stronger 6.6. 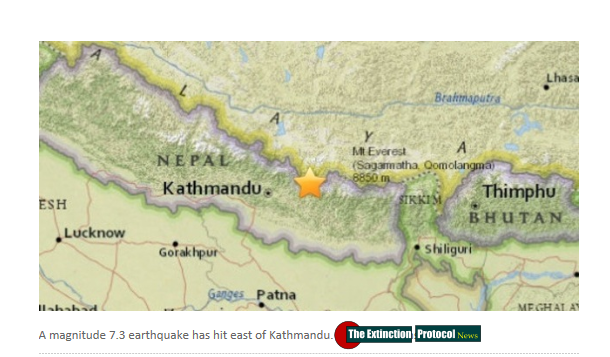 The United States Geological Survey (USGS), however, reported a preliminary magnitude of 6.4. Witnesses reported feeling the earthquake throughout the region, with tremors felt as far away as Guatemala and Belize. Computer models from the USGS estimated that some 22.1 million people may have felt the earthquake, including 232,000 people who may have observed "moderate" shaking. SAN FRANCISCO — The terrifying magnitude-7.8 Gorkha earthquake that rattled Nepal in April is nothing compared to the temblors scientists predict could happen in the future. The shaking observed was "unusually gentle" given the magnitude of the earthquake, leading to far fewer landslides and glacial lake overflows than could have been seen, researchers said here today (Dec. 16) at the annual meeting of the American Geophysical Union. "The situation could have been far, far worse," said Jeffrey Kargel, who was a co-author on one of two related papers published today in the journal Science and presented at the meeting. He and other scientists aren't sure exactly why the quake didn't wreak more havoc, but another temblor, even of similar magnitude, to hit the area may not be so forgiving, the researchers said. 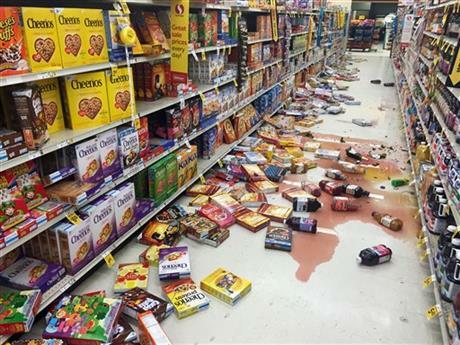 ANCHORAGE, Alaska (AP) — A magnitude-6.8 earthquake knocked items off shelves and walls in south-central Alaska and jolted the nerves of residents in this earthquake-prone region. But there were no immediate reports of injuries. 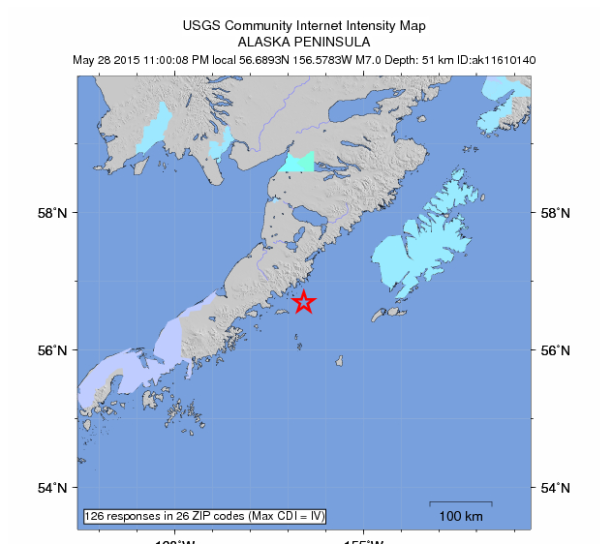 The earthquake struck about 1:30 a.m. Alaska time and was centered 53 miles west of Anchor Point in the Kenai Peninsula, which is about 160 miles southwest of Anchorage, according to the U.S. Geological Survey. About two hours later, a magnitude-4.3 aftershock hit the Cook Inlet, the agency said. A slightly stronger aftershock — magnitude-4.7 —hit the Cook Inlet at 5.29 a.m. The possibility of a gas leak led to the evacuation of more than a dozen homes in Kenai. The earthquake was widely felt by residents of Anchorage. But the Anchorage and Valdez police departments said they have not received any reports of injury or significant damage.